1J0906381A, 357906381A, 1008300003. Handles, Locks & Lock Cables. Fuel Injection. Body, Bumpers & Trims. Mass Air Flow Sensors. CADDY II Pickup (9U7) 06.96 - 12.00. TRANSPORTER T4 Box (70XA) 07.90 - 04.03. Suitable for the Audi, Seat & Skoda vehicles in the above compatibility table. A3 (96 - 03). A3 (03 - 12). FUEL PUMP RELAY. A3 Convertible (08 - 14). A3 Sporback (04 - 14). TT (98 - 06). A4 & Avant (00 - 04). This fuel pump replay will replace the original relay with number 167 and is normally a grey or white colour. Golf MK4 [1998-2006] 1.4, 1.6, 1.8, 2.0| 1.9 TDI. Golf MK3 [1991-1997] 1.4, 1.6, 1.8, 2.0. Suitable for the Volkswagen vehicles in the above compatibility table. FUEL PUMP RELAY. Rated Current (A) : 40. ITEM NUMBER C713. VW GOLF MK3 1.4, 1.6, 1.8, 1.9TDI, 2.0LGTI & VR6. VW GOLF MK2 1.3, 1.6, 1.88V& 1.816V. VW CORRADO 1.8, 2.0L & VR6. VW GOLF MK1 & CABRIOLET 1.6, 1.8 & GTI. A NEW FRONT WASH WIPE RELAY. 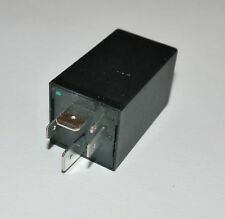 K-Jetronic fuel pump relay. Will work with all VAG K-Jets. Golf MK4 [1998-2005]. Bora [1998-2005]. Beetle 1C [1998-2010]. Passat B5 / B5.5 [1997-2005]. Imported direct from Germany. (VW Golf MK1 1981-1984 : Engine Code DX. 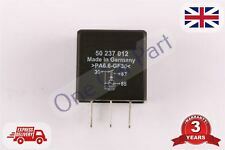 Quality Premium German Fuel Pump Relay. IV63, KA27 to 28, KW1 to 17, PA20 to 49, PA60 to 78, PH14 to 40, PH42 to 44, ZE1-3) & Islands (Isles), Non Mainland UK, Northern Ireland . [102HP-75KW] CAAB. [110HP-81KW] CBDC, CRVA, CUUA. [114HP-84KW] CAAD. [116HP-85KW] CFFE, CUVA. [120HP-88KW] BWV, CAGC. [121HP-89KW] BVG. [122HP-90KW] BVE. [126HP-93KW] BVF. A2 [2000-2005]. A3 8L [1997-2003]. TT MK1 8N [1998-2006]. A4 B5 [1996-2001]. 12 month warranty as standard. Fits the following cars LUPO (6X1, 6E1) (1998 - 2005). GOLF IV Variant (1J) (1998 - 2004). GOLF IV (1J1) (1997 - 2005). BORA (1J2) (1998 - 2005). OCTAVIA (1U2) (1996 - 2010). [136HP-100KW] CFFA, CRBD, CRLC. [140HP-103KW] CFFB. [143HP-105KW] CKFB, CRFC, CRVC. [150HP-110KW] CRBC, CRLB, CRMB, CRUA, CUVC, CYKA, DBGA, DCYA, DEJA, DFEA, DFGA. [170HP-125KW] CFGB. [177HP-130KW] CFGC, CRGA. ITEM NUMBER C990. VW GOLF MK1 1.5D & 1.6D. VW GOLF MK2 1.6D. VW T25, TRANSPORTER, CAMPER VAN. VW CADDY PICKUP 1.6D. A NEW GLOW PLUG RELAY. 171 911 261D, 171 911 261E, 443 911 261A. 171 911 261, 171 911 261A, 171 911 261B, 171 911 261C. NEW VOLKSWAGEN GLOW PLUG RELAY. VW - GOLF Mk III (1H1) - 1.9 TDI 04.96-08.97 - 81 1101896. VW - SANTANA (32B) - 1.6 D 08.81-12.84 -07.82 40 54 1588. VW - LT28-50 Bus (281-363) - 2.4 TD 12.82-07.89 - 75 102 2383. 1J0906381A, 357906381A, 1008300003. We have a friendly and knowledgeable team who are more than happy to help. GOLF IV Cabriolet (1E7) 06.98 - 06.02. TRANSPORTER T4 Platform/Chassis (70XD) 07.90 - 04.03. VW, AUDI, SEAT, SKODA MODEL CARS. Fuel Injection. Body, Bumpers & Trims. We have a friendly and knowledgeable team who are more than happy to help. 'ONE CAR PART' Sales Team. Heating & Cooling. Our Categories. TOPRAN 103 131. Relay function Indicator. Relay Number 21. Relay Number 191. PATRON P27-0008. 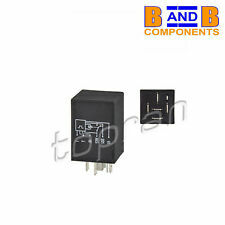 FLASHER RELAY FOR VEHICLES WITHOUT TOWBAR. 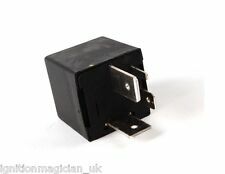 Flasher relay compatible with the vehicles listed below without a towbar fitted. Original Part Number (For Comparison Only). 003 544 27 32. 002 544 92 32. 002 544 91 32. Equivalent to part number: 141951253B. 12 months warranty on all orders. We will always attempt to rectify the issue as fast as possible! Eg, Vetech, Erst Klassig, Franzen, NK, etc. With this in mind, we will indicate what type of product you are looking at within the following guidelines. TOPRAN 202 146. Part Details. 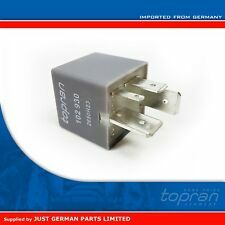 ECU Fuel Pump Relay N 109 VW Audi Seat Skoda 1J0906381A Grey 357906381A Wehrle. Condition is New. Dispatched with Royal Mail 2nd Class. Part Details HERTH BUSS ELPARTS 75614115. BOSCH 0 986 335 058. VW GOLF MK3 1.4, 1.6, 1.8, 1.9TDI, 2.0LGTI & VR6. VW GOLF MK2 1.3, 1.6, 1.88V & 1.816V. VW CORRADO 1.8, 2.0L & VR6. VW POLO 1.0L, 1.3, 1.4, 1.6 & 1.9D. VW GOLF MK1 & CABRIOLET 1.6, 1.8 & GTI. A NEW FRONT WASH WIPE RELAY. 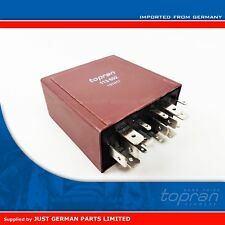 TOPRAN VW, AUDI, SEAT, SKODA Wiper Relay Nr. 389; 4B0 955 531C. SUITABLE FOR VW, AUDI, SEAT, SKODA MODEL CARS. TOPRAN 103 629. Relay function Indicator. Relay Number 22. FEBI BILSTEIN 22605. TOPRAN 116 262. Relay Number 428. 01/2005 1896 85 115 AJM Saloon. 01/2005 1896 85 115 AJM Estate. BDH Saloon. AVG Saloon. 10/2000 1896 81 110 AFN. AMM Saloon. 01/2005 1781 132 180 AJL Saloon. 01/2005 1984 96 130 ALT Estate. IMPORTANT NOTES: Relay No. : 398; For relay slot number: 4. IMPORTANT NOTES: Relay No. : 384; For relay slot number: 3. IMPORTANT NOTES: to Ch.No. : 8D-X-199999; Relay No. : 384; For relay slot number: 4. TOPRAN 113 601. Part Details. TOPRAN 115 668. Relay Number 460. 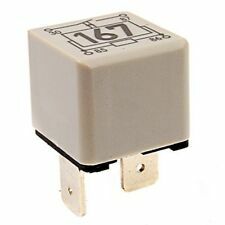 Car relays are electromagnetic switches that connect and disconnect electrical circuits within a vehicle when required. The starter solenoid is just as important; converting the current from the battery and ignition switch before safely channeling it to your starter motor. 11/1995 1998 100 136 X 20 XEV Hatchback. 08/1986 1796 85 115 18 E Hatchback. X 14 SZ Hatchback. 09/2000 1389 44 60 C 14 NZ. 01/1998 1799 92 125 C 18 XE Estate. 09/2000 1389 40 54 C 14 NZ. 01/1998 1796 66 90 C 18 NZ Estate. TOPRAN 113 602. Relay Number 602. Relay Number 377. Relay Number 378. Relay Number 389. Relay Number 601. Relay Number 603. Part Details. Free Text: Fuel Pump Relay. Depth [mm]: 30. Rated Current [A]: 15. Number of ports: 6. 09/1998 1896 47 64 AEY Saloon. 12/1994 2598 110 150 ABC Saloon. 09/1986 2226 85 115 KZ Estate. 12/1994 2309 98 133 NG Saloon. 12/1988 2226 101 137 KU Estate. 12/1994 1984 85 115 ABK Saloon. 07/1984 2144 96 131 KF Estate.